Powers: Neurotap can send bio-pulses through the ocular cavity resulting in the scrambling of synaptic relays and the nervous system. These bio pulses can render one unconscious, disoriented or cause death. Michelle Balters life changed irrevocably when her powers manifested two years her family had incurred major debt because of her terrible headaches and coma’s due to the onset of her powers. When they realized she was a mutant she ran away from home because she realized how unhappy she had made her family. Now living in Denver she answered a newspaper advertisement looking for people with “Special talents”. Her unique abilities lead her to the attention of Martin Strong, head of the “Strong Foundation” who had placed the advertisement. Landing a job with the company she met and fell in love with “Adam-X”. When she discovered the ant-mutant agenda of the company she fled and brought X-force including Sunspot/Roberto Da Costa to the company. When the team arrived she revealed it was a trap to get more mutants for experimentation as Strong had promised her he would cure her of her abilities. 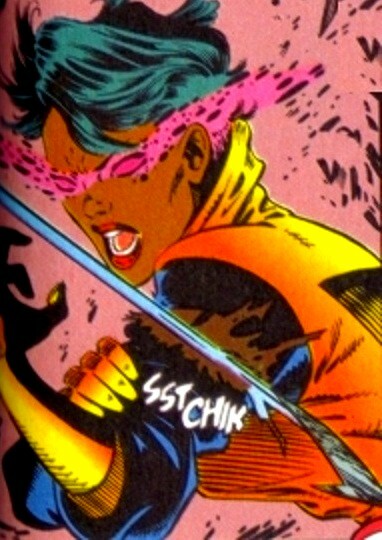 Adam-X and X-force defeated her and Strong ending the threat. With Strong in jail she still continued to work for the company in hopes of being cured. She eventually contacted both Shatterstar and Rictor for assistance during another adventure making peace with the team in the process. She retained her powers after “M-Day” and was a potential recruit for the Avengers Initiative. Strangely she did not join her fellow mutants on Utopia. It’s assumed she retired from heroics.